With brilliant, long-lasting results in about an hour, Zoom!® teeth whitening is a quick way to brighten your smile. 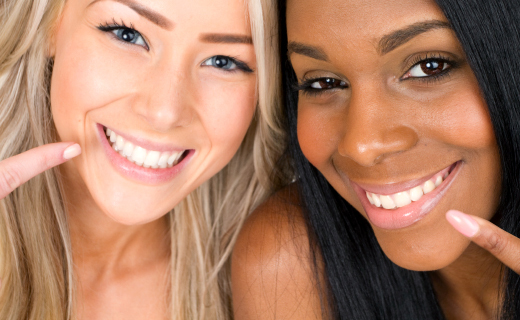 By using a bleaching gel and a special lamp designed to activate the gel, our cosmetic dentists in Baltimore use this dental teeth whitening technique offers an average of eight shades of improvement in one treatment. We take pride in our patient care and want you to be completely satisfied with your results, so we perform a thorough dental exam to determine the cause of your discoloration before teeth whitening. This is important because peroxide-based teeth whiteners do not work on tetracycline stains, crowns or veneers, and diet and certain medications can affect the expected results. In addition, some teeth may be discolored due to defective fillings or decay requiring repair before cosmetic whitening. Gum disease and other routine dental care may also need to be completed before you can experience the maximum benefits of Zoom!® in Baltimore. Overall everyone and evrything was nice. Clean environment! Awesome service; great hours and availability. Very good at discussing your care plan so that you understand it. Dr. Patel is very informative and attentive during my visits. I also liked my hygienist during my visit on Monday. Devin is ALWAYS very friendly and knowledgeable. I love when I come here. And Ms Denise cleaned my teeth she did a great job, gave additional advice. Very nice and sensitive to the fact my jaw was recently broken! !